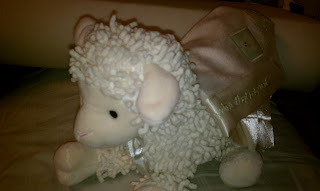 There are quiet a few Lovies to chose from, I chose the Personalized "Love Ewe" Plush Lamb and Lovie Gift Set. 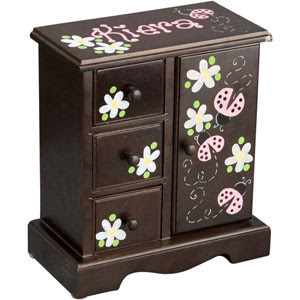 Satin trim on blanket is embroidered with "Everywhere that baby went, the lamb was sure to go"
And if you are looking for more items you can personalize they have gifts like the Musical Jewelry Armoire Espresso, I love anything with a personalized name on it, I had things like this as a child and felt so special when I received them. 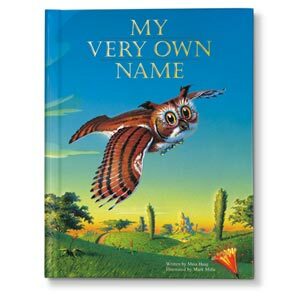 Another great gift idea is the My Very Own Name Personalized Story Book, This charming book highlights the child's first name, last name and birth date, using beautifully illustrated animals to bring the names to life. Within the playfully rhyming story, the tiger brings the T, the yak brings the Y, and the book - while sharing interesting facts about each of the animals - brings joy, education and fun to reading time. 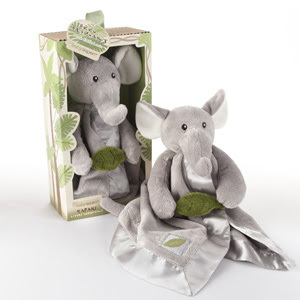 This unique children's gift is perfect for newborns, as well as boys and girls up to age eight. Check out The Corner Stork Baby Gifts for your Holiday Gifts, you can shop by Featured Baby Gifts, Collections, Necessities and More. Win a Lovie for your little one Winners Choice of Puppy, Ekko the Elephant, Jakka the Giraffe, The Cow Jumped Over the Moon or Love Ewe Lamb. 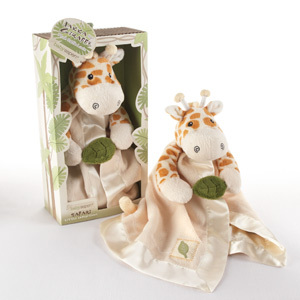 What product from the Unique Baby Gifts section from Corner Stork Baby Gifts do you like? I love the terry shark robe too! I love the "let the fin begin" robe! I love the "Big Dreamzzz" Baby MD - Baby Scrubs!! I lovelovelove the "Let the Fin Begin" Terry Shark Robe!! I really like the Plush "Monkey Magoo and Blankie Too!" in Banana Baby Gift Box. So cute! I would like to win this for my daughter Katie who is expecting after many long years of waiting patiently. my favorite is jakka the girrafe. cute!!! i like corner stork baby gifts on facebook! The Splish Splash! Bath Time Baby Gift Basket would be lovely as well. I love the "Sleep Sheep" Soothing Sounds Nighttime Companion! I follow Corner Stork Baby Gifts on Facebook under the username likwan. I follow Corner Stork Baby Gifts on Twitter under the username likwan. I shared this giveaway on Facebook at http://www.facebook.com/likwan/posts/306616236036032. I tweeted the requested message on Twitter at https://twitter.com/#!/likwan/status/146504539888029696.